Together these components are referred to as the LASERS, and each one contains Action Steps. These steps articulate practices that need to be in place to support the successful implementation of a comprehensive literacy program. Increasing capacity at the state, district, campus, and classroom levels in these six areas is necessary to ensure the success of the next generation of college and career ready Texans. Leadership at the state, district/organization, campus/site, and classroom/provider levels is critical to the success of children in Texas. At every level, leadership teams form Professional Learning Communities that meet regularly to examine student performance data, determine what students need to be successful, and what adults need to learn to ensure that success. The teams create a plan of action for providing resources of time, materials, and professional development, implement the plan, and evaluate its results. Assessment provides the foundation for student data, which in turn, guides decision-making at every level. Measures must be valid and inclusive of assessment in first and second languages for English language learners. Assessment should include both formal and informal measures. Formal assessment includes screening, diagnostic, progress monitoring, and outcome measures. 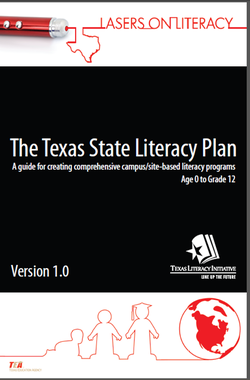 Standards-based Instruction founded on the Texas Essential Knowledge and Skills, in both English and Spanish, using evidence-based materials, is at the heart of core reading and writing for Texas students. Providing a solid foundation of instruction will prevent difficulties that require intensive intervention for most students. Effective Instructional Framework is built on a Response to Intervention model for students who struggle with reading and writing, but also includes differentiated instruction for English language learners, students identified as gifted and talented, and as needing dyslexia or special education services. Reporting and Accountability centers on the reporting required by the State of Texas, including student outcomes and teacher appraisal. Sustainability is the ultimate key to ensuring all students leave our public schools as College and Career Ready Texans. Leveraging funding resources, continuous evaluation of implementation, monitoring and supporting teaching and learning, providing effective professional development, and focusing decision-making on data are necessary steps in assuring sustainability.